Database/DBMS Interview Questions And Answers - Part XIV. Answer: The purpose of second normal form (2NF) is to eliminate partial key dependencies. Each attribute in an entity must depend on the whole key, not just a part of it. Definition: A relation Schema R is in 2NF if every non-prime attribute A in R is fully functionally dependent on the primary key of R.
Answer: Third Normal form also helps to eliminate redundant information by eliminating inter dependencies between non-key attributes. Before proceeding to 3NF, check that it is already in 2NF and there are no non-key attributes that depend on another non-key attribute. 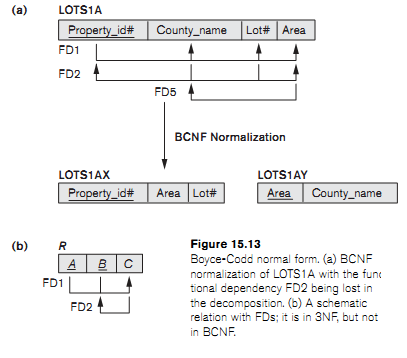 Answer: A relation schema R is in Boyce-Codd Normal Form (BCNF) if whenever an FD X -> A holds in R, then X is a superkey of R.
Every 2NF relation is in 1NF. Every 3NF relation is in 2NF. Every BCNF relation is in 3NF. There exist relations that are in 3NF but not in BCNF. The goal is to have each relation in BCNF (or 3NF). t3[X] = t4[X] = t1[X] = t2[X]. t3[Y] = t1[Y] and t4[Y] = t2[Y]. t3[Z] = t2[Z] and t4[Z] = t1[Z]. An MVD X —> Y in R is called a trivial MVD if (a) Y is a subset of X, or (b) X X —> Y = R.